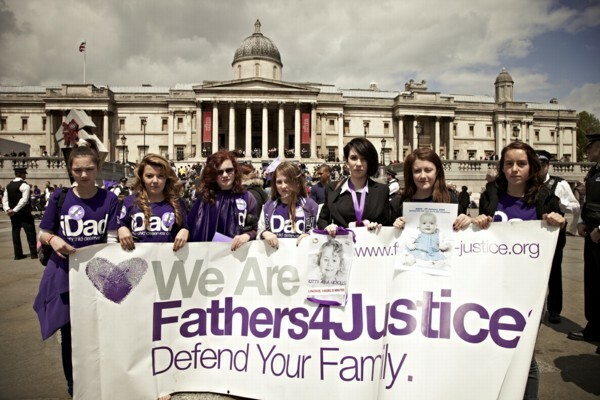 Fathers 4 Justice (or F4J) began as a fathers' rights organisation in the United Kingdom. It became prominent and frequently discussed in the media following a series of high-visibility stunts and protests often in costume. It was temporarily disbanded in January 2006, following allegations of a plot by members to kidnap the youngest son of then-Prime Minister Tony Blair[wp]. Four months later, in May 2006, the group reformed and protested during the live broadcast of the BBC[wp] lottery show The National Lottery: Jet Set. Fathers 4 Justice was founded in the UK by Matt O'Connor, a marketing consultant and father. Following separation from his wife in 2000, O'Connor became a prominent critic of UK family law after a court barred him from seeing his young sons outside of a contact centre. F4J's stated aim is to champion the cause of equal parenting, family law reform and equal contact for divorced parents with children. It is well-known for its campaigning techniques of dramatic protest stunts, usually dressed as comic book superheroes and frequently scaling public buildings, bridges and monuments. Stunts have included supporters storming courts dressed in Father Christmas outfits, clapping the Government's "Children's Minister" in handcuffs, and most notably group member Jason Hatch climbing onto Buckingham Palace[wp] dressed as Batman. They have also protested by handcuffing two government ministers. On 17 December 2002, O'Connor and a small group of supporters staged their first protest by storming the Lord Chancellor's Office dressed as Father Christmas. In January 2003, O'Connor officially founded Fathers 4 Justice. The group targeted the homes of family court judges and family lawyers' homes and offices with traditional protests. On 21 October 2003, campaigners Eddie "Goldtooth" Gorecki and Jonathan "Jolly" Stanesby scaled the Royal Courts of Justice, dressed respectively as Batman and Robin. The following day, the group's members rallied through London around a military tank in solidarity with Goreckwi and Stanesby. Nine days later, group member David Chick scaled a 120 feet (37 m) crane near Tower Bridge, London dressed as Spider-Man. The Metropolitan Police set up a cordon around the area that disrupted traffic through some of East London for several days. Chick was subsequently cleared and published a ghost-written autobiography in February 2006. On the morning of 22 December 2003, four campaigners - Eddie Gorecki, Jolly Stanesby, Michael Sadeh and Steve Battlershill - dressed as Father Christmas and climbed on top of Tower Bridge. They hung up a banner calling for the resignation of then Minister for Children Margaret Hodge, who they held responsible for perceived inequalities in family law. The four were charged with conspiracy, but the charge was dropped at the start of the trial a year later. In 2004 Stanesby carried out a "citizens arrest" of Margaret Hodge at a conference, handcuffing himself to her and stating "Margaret Hodge, I'm arresting you for covering up child abuse." Both Stanseby and Jason Hatch (who had also attempted to handcuff himself to Hodge) were later cleared by a jury of charges of false imprisonment. On 19 May 2004, a major alert was caused when two members of the group threw purple flour bombs at Tony Blair during Prime Minister's Questions at the House of Commons. Following the House of Commons incident The Times wrote that the group "has succeeded in becoming the most prominent guerrilla pressure group in Britain ... within eighteen months of its founding." In September 2004 the group made headlines around the world when member Jason Hatch scaled the walls of Buckingham Palace dressed as Batman. All charges relating to his protest were later dropped. Also in September protester David Chick scaled The London Eye, forcing the attraction to close. He was found not guilty of charges of causing a public nuisance. Protester Ray Barry scaled St Peter's Church in Wolverhampton on Fathers Day in 2005. He was cleared of a charge of a public order offence and then repeated the protest on Christmas Day. On 27 September 2005, protester Guy Harrison scaled The Houses of Parliament unveiling a banner stating "Does Blair care? For Fawkes sake change family law." A jury acquitted him of the charge of committing a public nuisance offence. In November 2005, the group received negative publicity when the prime-time ITV programme Tonight With Trevor McDonald appeared to expose some of its members as violent and obnoxious in their behaviour. However, counter-claims have been made that these were never members in the first place and that the programme gave no right to reply. Some members were expelled but the organisation defended its position and attacked the documentary. On 23 November 2005, Fathers 4 Justice ended its truce with the Children and Family Court Advisory and Support Service (CAFCASS) and the Child Support Agency (CPS), calling for a public inquiry into family law. During January 2006 the British newspaper The Sun published a story in which it claimed fringe F4J members planned to kidnap Leo Blair, the young son of former Prime Minister Tony Blair 'for a few hours as a symbolic gesture'. The police said they were aware of such a plan, but added it had probably never progressed beyond the "chattering stage". Downing Street refused to confirm or deny the existence of a plot as it does not comment on matters concerning the Prime Minister's children. Founder O'Connor condemned the alleged plot and threatened to shut down the group because of it. Within days, Fathers 4 Justice had been disbanded. On 20 May 2006, Fathers 4 Justice protested during the showing of the BBC lottery show "The National Lottery: Jet Set". The show was taken off-air for several minutes after six Fathers 4 Justice protesters ran from the audience onto the stage displaying posters. The protesters were soon removed from the studio and the lottery draws were hurriedly finished in order to start coverage of the 2006 Eurovision Song Contest. A group spokesman stated afterwards that the incident marked a "dramatic return" of Fathers 4 Justice. In July 2007 F4J member and barrister Michael Cox was jailed for refusing to pay money he owed to the Child Support Agency. Cox told a hearing in Southampton he refused to pay on principle, as he had joint custody of his children, and his former wife wrote to the court in support of him. On 8 June 2008, two fathers from Fathers 4 Justice climbed onto the roof of Labour deputy leader Harriet Harman's house wearing superhero-style costumes dubbed "Captain Conception" and "Cash Gordon". One of the pair, Mark Harris, said he wanted fathers to have the same right as their mothers' new partners. He also said they would not come down unless Harman read his book, "Family Court Hell". Harris later received a conditional discharge while his colleague Jolly Stanesby was jailed for two months. In the same month, Bristol Family Court was evacuated after a protest by around 30 F4J supporters. On 9 July 2008, another set of fathers who were not part of the F4J organisation, this time in Spider-Man and Batman outfits, scaled Harman's roof and draped a banner emblazoned "Stop The War On Dads". Nigel Ace, the Spider-Man character, called for legal reforms through a loudhailer on the roof. Harman claimed the group had never sought democratic dialogue with her, but O'Connor claimed he had been ignored after trying to get in touch through his MP Mark Oaten. Members of the group are alleged to have conducted intimidating attacks in order to upset court staff and family lawyers. These attacks include throwing purple paint - the group's colour - on the outside of CAFCASS buildings, pushing rotten meat or fish through letterboxes, sending fake bombs, hate mail and verbal abuse. Fathers 4 Justice has admitted to incidents involving CAFCASS property but deny harassing individuals. During protests outside CAFCASS offices, individual case workers were identified by name in a similar style to animal rights protesters. One office was invaded by F4J members and detained an unnamed employee, (however, no criminal proceedings are known to have resulted). Fathers 4 Justice's main impact remains upon media coverage and legal treatment of fathers' rights issues in the UK. The use of high-profile and disruptive stunts has garnered significant UK media coverage. The political aims of the group are as yet unachieved, but one of its central aims - the removal of secrecy surrounding family courts - is the subject of active political debate. In 2006, the Court of Appeal set a precedent allowing adults to discuss secret cases after they had finished. This resulted in a number of high-profile scandals, chiefly concerning adoption. In February 2009, Justice Minister Jack Straw announced plans to reverse this ruling. A significant, unintended result of the F4J campaign has been the exposure of flaws in security at high-profile British institutions, resulting in security enquiries or reviews at Buckingham Palace and the House of Commons. This article based on an article Fathers 4 Justice (29 September 2011) from the free Encyklopedia Wikipedia. The Wikipedia article is published under the dual license GNU-License for free Documentation and Attribution-ShareAlike 3.0 Unported (CC BY-SA 3.0). In Wikipedia is a List of Authors available those who worked on the text before being incorporated in WikiMANNia. This page was last modified on 28 November 2013, at 22:54. This page has been accessed 7,669 times and contains 15,773 characters or 2,329 words.